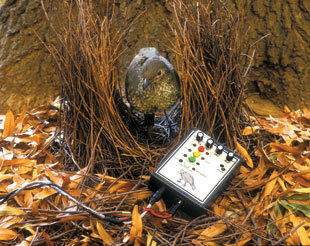 FOLLOW THE ROBOTS: More and more, researchers are turning to robots to answer questions in animal behavior. 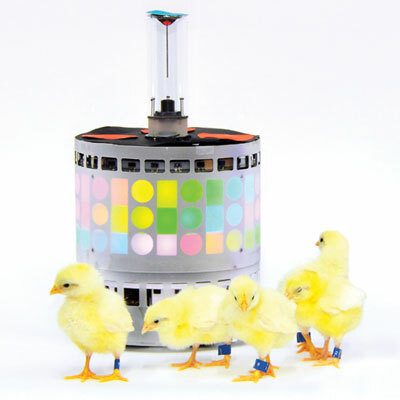 Here, young chickens following a robotic mother shed light on the process of imprinting.COURTESY OF JOSE HALLOY, FRANCESCO MONDADA EPFL GROUPAs a PhD student at the University of Toulouse in France, Simon Garnier was fascinated by the chemical signposts used by Argentine ants—an invasive species from the Mediterranean to California—to navigate their savanna environment. As the insects traverse complex terrain, they leave traces of pheromones that other ants will then follow, reinforcing the trailblazers’ path. “In nature, they will create these big networks of pheromone trails, sort of like the road system for us,” Garnier explains. And despite their wide-ranging and convoluted habitats, the ants always seem to construct highways that carve the shortest route back to the nest from a food source. Such navigational efficiency might suggest an advanced intelligence in these tiny-brained insects. The ants, which tend to take the path with the smallest angle of deviation at each fork in a complex maze, could be computing the angles at each bifurcation. But Garnier knew there might be a simpler answer: by just trying to head straight, the ants would have a greater chance of taking the less deviant path—no complex angle measurements required. 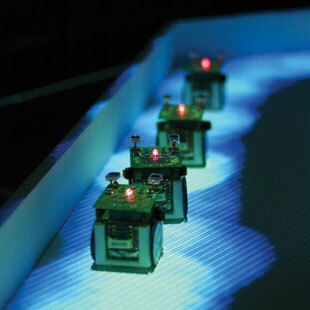 FOLLOW THE LIGHT: These robotic ants sense and follow the blue light that is projected on the arena floor. 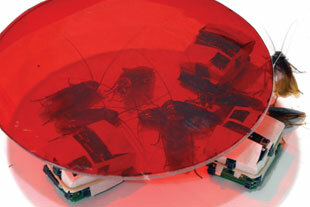 As more robo-ants traverse a path, the brighter the light shines. Groups of these robo-ants mimicked the behavior of real ants—following the less deviant path at a fork in the road—without the need for complex cognitive processing.CNRS PHOTOTHEQUE/CRCA TOULOUSE/SIMON GARNIER Today, a growing number of scientists are using autonomous robots to interrogate animal behavior and cognition. Researchers have designed robots to behave like ants, cockroaches, rodents, chickens, and more, then deployed their bots in the lab or in the environment to see how similarly they behave to their flesh-and-blood counterparts. In some cases, experimenters have thrown robots in with animals to see how they interact, and have even programmed robots to influence group decisions. As Garnier’s efficiently navigating robo-ants demonstrated, complex behaviors are not always what they seem. 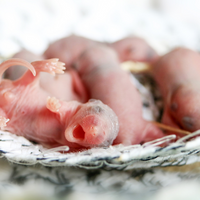 Schank came to the same realization completely by accident, while investigating how young rats huddle together with their nest mates during the first week of life. He and his colleagues built self-propelled robot rats, about four times larger than real rat pups, but constructed to have the same general body shape. 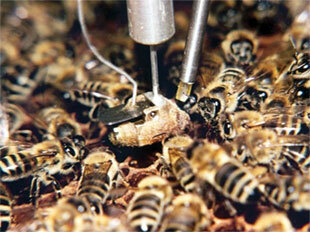 Each robot was equipped with a ring of pressure sensors that allowed it to respond to contact. Schank coded the rules of aggregation he’d developed from a computer simulation into the robots, and when he set them loose in an arena four times the size of the space he’d given to real rat pups, he thought it was a smashing success. Not only did the bots move around the space like the rat pups did, they aggregated in remarkably similar ways to the real animals.3 Then Schank realized that there was a bug in his program. The robots weren’t following his predetermined rules; they were moving randomly. But by asking such engineering questions, researchers often get biological answers. When Frank Grasso, director of the Biomimetic and Cognitive Robotics Lab at the City University of New York in Brooklyn, began designing robots to investigate lobster navigation, he soon learned that having the robots recognize and follow scents wasn’t sufficient. Grasso first programmed his robo-lobsters—which consisted of a cylindrical body on two large wheels and fiber-optic antennae that detected chemicals in the water—to head toward high concentrations of an odor, the general principle believed to be used by real lobsters to locate their prey. (See photograph at right.) But this rule failed to recapitulate natural lobster behavior. However, when the researchers also gave the robots a sense of flow, and programmed them to assume that odors come from upstream, the bots much more closely mimicked real lobster behavior. “That was a demonstration that the animals’ brains were multimodal—that they were using chemical information and flow information,” says Grasso, who has since worked on robotic models of octopus arms and crayfish. University of Sheffield evolutionary biologist Marshall is tackling a similar problem as he tries to simulate how honeybees process visual input. Part of a multi-institution collaboration to model the entire honeybee brain on a supercomputer and use the simulation to control two flying robots, Marshall is developing the algorithms that will dictate how the robots see through their camera eyes. 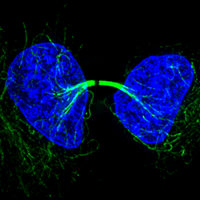 While the neural circuitry underlying the olfaction system has been well studied in bees, the vision system has “not been described to anywhere near the same extent,” says Marshall. 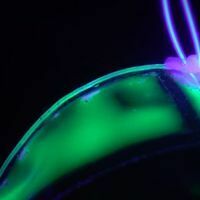 “So there we’re working much more in the dark,” gathering clues from what’s known about vision in other insect species, including Drosophila and bumblebees, while making logical assumptions from an engineering perspective as well. With the advent of autonomous, sensing-and-reacting robots, however, the introduction of robots into animal societies has taken on a whole different meaning. “The idea here is to build mixed groups of animals and robots that interact [and] show social interaction in the long term,” says Université Paris Diderot researcher José Halloy, who has tested the ability of robotic cockroaches to interact with the real insects. But building a robot that animals will accept as one of their own is complicated, to say the least. Robots employed to explore theoretical concepts of behavior and cognition don’t necessarily have to look exactly like the animals they’re mimicking. But to develop social relationships with real animals, robots have to look, smell, and act the part at least well enough to fool the research subjects. “It’s a very challenging task . . . to build a device that’s capable of being part of the group,” says Halloy. Of course, with more discerning species, the task becomes more difficult, says Couzin, who has found that while sticklebacks seem to display fairly natural responses to the faux fish, golden shiners are more sensitive to the acoustic vibrations caused by the robot’s motor. “To convince them that your model fish is really a fish can be quite tricky,” he says. So for his second venture into mixed animal-robot societies, Halloy turned to another well-studied system: imprinting in birds. Inspired by the classic imprinting experiment in which a group of goslings hatched to see Austrian biologist Konrad Lorenz hovering over them, and then proceeded to follow the father of ethology instead of their real mother, Halloy taught hundreds of 8- to 12-hour-old chickens to imprint on a robot that he controlled. Now in Paris, Halloy continues to probe animal group dynamics using robots. 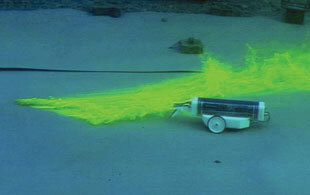 In February, he began a project to design robots to interact with schools of fish. The robots will be situated outside of the tank, where they can carry some sort of lure, Halloy says—“a fake fish or anything else that can send signals to the group of fish.” In a parallel project, researchers at the University of Graz in Austria are aiming to do something similar with juvenile honeybees, using a static array of devices that can send a moving signal to the bees. Autonomous, sensing-and-reacting robots have only begun to prove their worth in behavioral ethology in the last decade or two, but robotics and biology have been intertwined for much longer. Since its inception, robotics has been taking its cues from biology, drawing inspiration from nature’s proven solutions for sensing and moving about a complex environment. And in biology, researchers have long been using robotics techniques to animate “dummies”—physical models of animals that can be presented to animals in and out of the lab. “[Robots] can be a tool like a special social microscope to study animal behavior,” says José Halloy of the Université Paris Diderot. Here are some examples—past and present—of how researchers have used robotic models to ask questions about animal behavior. 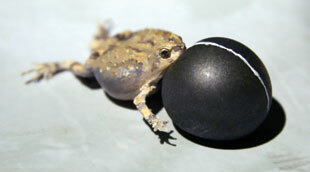 BARRETT KLEINAmorous túngara frogs of the Panamanian rain forests inflate a large vocal sac in their throat, but “the vocal sac is way bigger than it needs to be for actual sound production,” says Ryan Taylor of Salisbury University in Maryland. Knowing that frogs see well at night—peak mating time—he wondered if the vocal sac might be serving as a visual cue, in addition to the call it helped produce. To isolate sound from vision in their experiments, Taylor and his colleagues turned to robots. They built their robo-frogs using a rubber model, then hooked the robots up to a machine that pumps air into faux vocal sacs, causing them to inflate like those of a real frog. They can then program the device to coordinate the audio signal from the speakers with inflation of the vocal sac, or to dissociate those stimuli. Sure enough, the timing of the vocal sac inflation, relative to the two notes of the male’s call, “seems to be really important for the females,” says Taylor. S. Garnier et al., “Do ants need to estimate the geometrical properties of trail bifurcations to find an efficient route? 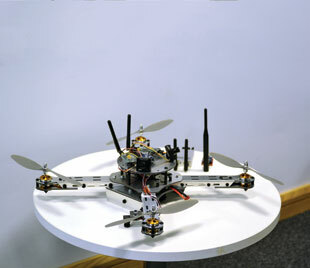 A swarm robotics test bed,” PLOS Comp Bio, 9:e1002903, 2013. B. Webb, “Using robots to model animals: a cricket test,” Robot Auton Syst, 16:117-34, 1995. C.J. May et al., “Rat pups and random robots generate similar self-organized and intentional behavior,” Complexity, 12:53-66, 2006. J. Halloy et al., “Social integration of robots into groups of cockroaches to control self-organized choices,” Science, 318:1155-58, 2007. D.T. Swain et al., “Real-time feedback-controlled robotic fish for behavioral experiments with fish schools,” Proc IEEE, 100:150-63 2012. A. Gribovskiy et al., “Towards mixed societies of chickens and robots,” The IEEE/RSJ 2010 International Conference on Intelligent Robots and Systems, Taipei, Taiwan, October 18-22, 2010. A. Michelsen et al., “How honeybees perceive communication dances, studied by means of a mechanical model,” Behav Ecol Sociobiol, 30:143-50, 1992. G.L. Patricelli et al., “Male satin bowerbirds, Ptilonorhynchus violaceus, adjust their display intensity in response to female startling: an experiment with robotic females,” Animal Behaviour, 71:49-59, 2006. G.L. 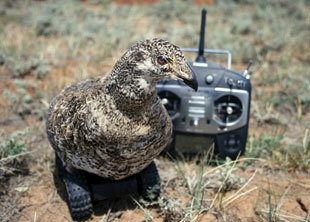 Patricelli, A.H. Krakauer, “Tactical allocation of effort among multiple signals in sage grouse: an experiment with a robotic female,” Behavioral Ecology, 21:97-106, 2010. 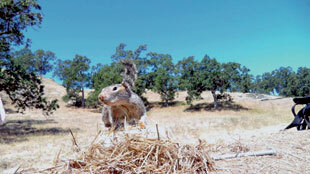 A.S. Rundus et al., “Ground squirrels use an infrared signal to deter rattlesnake predation,” PNAS, 104:14372-76, 2007.